Mornings are getting chillier, coffee drinkers have transitioned to requesting their drinks “hot” instead of “iced”, and the leaves along Highway 169 are exploding with color; that can only mean one thing: Family Weekend at Gustavus! The campus welcomes friends and family back to the hill for a weekend of events and activities this Saturday and Sunday. 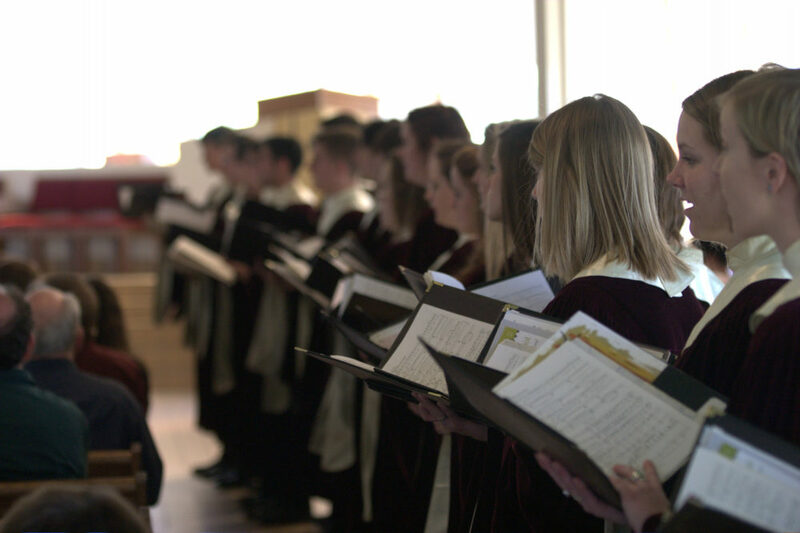 The Department of Fine Arts offers a wide variety of opportunities for Gusties and their families to join the festivities, from extended hours at the Hillstrom Museum, to a joyful chapel service and showcase concert featuring several hundred fantastic musicians. Both the chapel service and showcase concert will be livestreamed for those who cannot make it to campus. The Hillstrom Museum of Art offers extended hours (10 a.m.–5 p.m. Saturday and 1 p.m.–5 p.m. Sunday) for visitors to view current exhibits, “Focus In/On Reginald Marsh’s Manhattan Towers” and “Contemporary American Painting : Selections from the Hillstrom Museum of Art, Gustavus Adolphus college, and the Perlman Teaching Museum, Carleton College”. The annual Family Weekend Chapel Service at 10:30 a.m. on Sunday in Christ Chapel, features the Choir of Christ Chapel, Lucia Singers, Gustavus Wind Symphony, and Adolphus Jazz Ensemble. The ensembles will provide music throughout the service, led by chaplain Siri Erickson and organist Chad Winterfeldt. The Gustavus Jazz Ensemble, Gustavus Symphony Orchestra, Gustavus Choir, and Gustavus Wind Orchestra will perform at 2 p.m. on Sunday in Christ Chapel for the Family Weekend Showcase Concert. The concert gives parents, family, and friends the chance to see all four ensembles in one event. This year’s repertoire features works by Gerswhin, Mozart, Bizet, Ticheli, and Kabalevsky. All events are free and open to the public, no tickets are required.